Ultralight titanium is corrosion-resistant and lasts for years. Rounded bottom edges make cleaning easy and improves heating efficiency. Handles fold away for compact storage. Titanium leaves no metallic smell or taste. The 1″ deep pan doubles as a lid or a sauce pan. 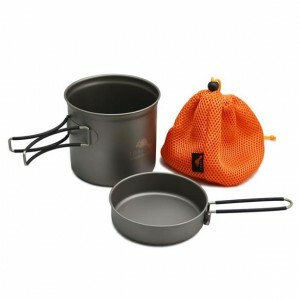 A couple of weeks ago I reviewed the Ultralight Titanium Cook System which only comes with a 550ml pot. With my large family, I felt that I needed something bigger for those times when they are with me. But whatever I picked up, it still needed to be light enough to pack. I was happy with the quality of the TOAKS 550ml pot so I thought that I would check out their larger cookware. Like the 550ml pot provided in the Ultralight Titanium Cook System, the high-quality of the CKW-1600 and CKW-1100 remained consistent. The pots and pans are durable, easy to clean and very sturdy. The sauce pan fits the larger pot as a raised lid perfectly. Although, like the traditional lid, the fit of the pan is not very tight leaving room for improvement. If you prefer to use a traditional lid, you can purchase the LID-145 for the CKW-1600 and the LID-115 for the CKW-1100 separately. The wire handles on pots and pans are coated so they won’t get too hot to touch and they fold away for compact storage. Truly an improvement over many of TOAKS’ the smaller cups and pots. The pouches that are supplied with the CKW-1600 and CKW-1100 are made from a durable dual-layer nylon mesh material with a form-fitted flat bottom and a draw-string with a plastic cord-lock that is easy to operate. Not only does the pouch keep the kit well protected, it could also be used as a coarse filter should you ever needed one. The CKW-1600 holds 6.76 cups (1600ml) when filled to the brim. However, to avoid spillage you would likely only fill with 6 cups or less to heat or boil. The CKW-1600 is extremely lightweight at only 7.5 ounces, and 8.2 ounces with the pouch included. It can hold a Ultralight Titanium Cook System, two small RatTowels and a 2 ounce bottle of camp soap inside with plenty of room to spare. The CKW-1100 holds 4.65 cups (1100ml) when filled to the brim. And like the CKW-1600, you would likely only fill with 4 cups or less to heat or boil. The CKW-1100 is also extremely lightweight at only 5.9 ounces, and 6.5 ounces with the pouch included. Though it is a much tighter fit, it too can hold a Ultralight Titanium Cook System, two small RatTowels and a 2 ounce bottle of camp soap with a little room to spare. 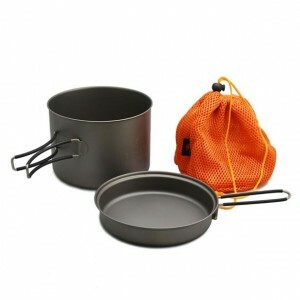 When it comes to sturdy, high-quality cookware for a reasonable price, TOAKS definitely puts skin in the game. From their titanium tent stakes and titanium spork to their Ultralight Titanium Cook System and these two titanium pot and pan sets, the quality materials and durable finish has remained consistent throughout their entire product line. After using both cookware sets for a while now, I’ve noticed that the smaller size and lighter weight make it a much more attractive option. Especially if you don’t need the extra capacity of the CKW-1600. However, for some reason the CKW-1100 is just a few dollars more even though it is 500ml smaller. 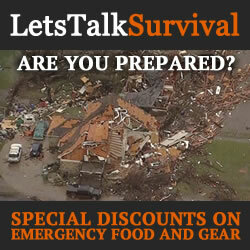 TOAKS Outdoor is a specialty adventure store based in southern California. 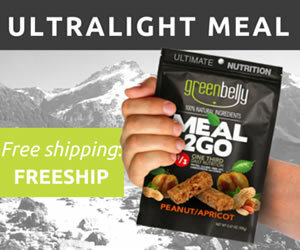 We’re a rapidly growing company specializing in quality hiking and backpacking gear. Created under the simple mission of excellence, TOAKS Outdoor is committed to equipping you for your adventures. We strive to provide the best outdoor products at great prices, with quality customer care.